I’m a fan of delays. Basically, they’re broken down into 2 camps.. digital delay or analog delay. Digitals can replicate analog tone, but analogs can’t achieve the digital effect. So when you’re shopping for delays, you need to understand what you want to get out of the delays. Personally, on my board, I have a digital and a analog delay for my tone. I like the analog for the darker delay trails, and that effect is part of my ‘stock’ tone. The digital is used for very clear long trails and intense delay craziness. You can get some wild feedback stuff with analogs, but the very clear long trails are a digital trait. I came across this interesting shootout of 22 delays. This is not the ‘greatest’ shootout, since they’re all set on one setting, and doesn’t compare how each delay is capable of. BUT, what I did like, was to be able to hear the characteristics of the delay trails, which is a very important feature when picking out delay pedals (in my opinion). He basically, goes with the Edge (of U2) style tone with a Vox AC30 chime and delay, so you get to hear some consistency, even though he’s not playing the same riff for each pedal. 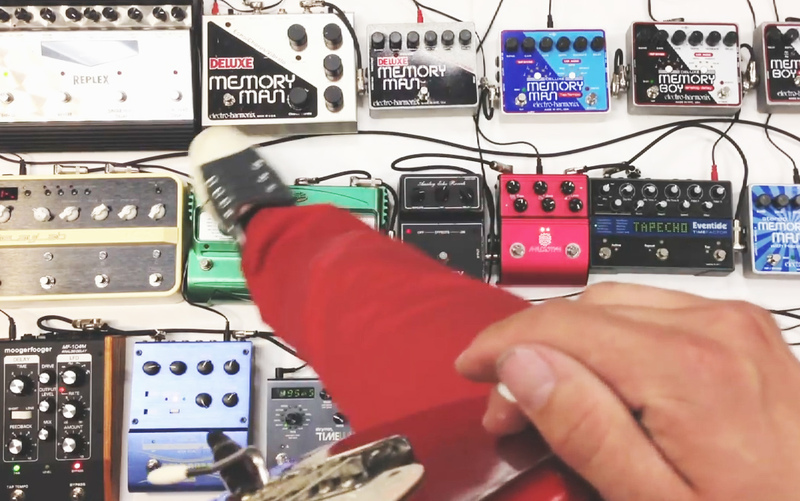 There were a few pedals that were cool to hear, since they’re not that common – the Morley Echo Reverb and Analogman ARDL20 were great to see in there. I was surprised that the TC Electronic Flashback and MXR Carbon Copy were not in the mix, but getting 22 different delays was quite the challenge I bet. Let me know what you think by commenting below! Was there a favorite? If so.. why? All though I own an El Capistan, The Moog stood out, I thought! It had body and depth!